The Bethlehem Shipbuilding Company of San Francisco built K-type car #178 in 1923, and it spent its entire service life on the streets of San Francisco. When new, it was painted gray with a terra-cotta color roof and tuscan red sash. In 1941, this gave way to a blue and yellow paint scheme, the California State colors. 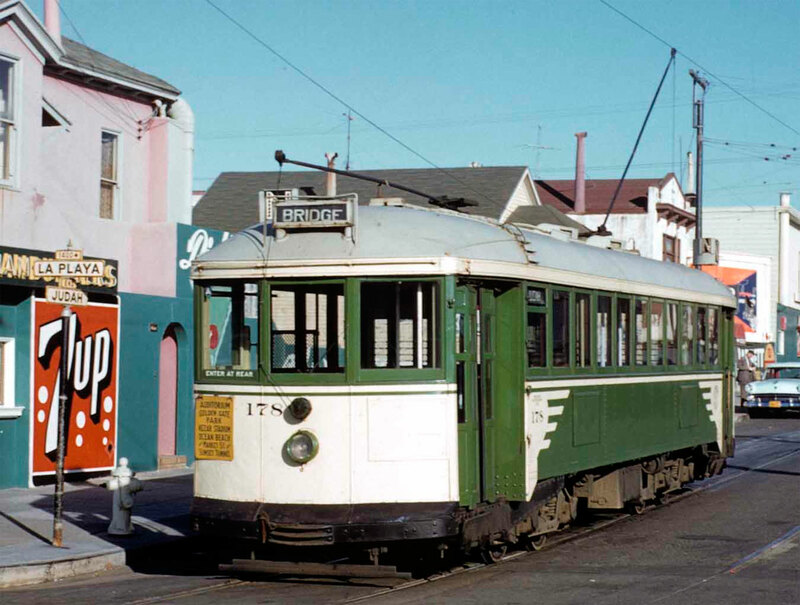 Lastly in the early 1950s it was painted in a green and cream paint scheme developed by then Muni General Manager Charles D. Miller. The 178 was built with enclosed end sections but retained the open platforms: a pantograph style gate for the entrance, a sliding, wire mesh gate for the exit, and a wire mesh right front side "window". Always operated by a two-man crew, the passengers entered at the rear, paid their fare, and moved forward to exit via the front. The pantograph gates had fold down planks to provide additional seating when the gate was at the front end of the car and closed. Post WWII improvements included replacement of the pantograph entrance gates with air operated doors salvaged from scrapped Market St Railway cars. These were installed for safety reasons within the Twin Peaks Tunnel. Glass was substituted in place of the wire mesh window. Eclipse fenders were replaced with underfloor life guard type fenders obtained from scrapped Key System streetcars. 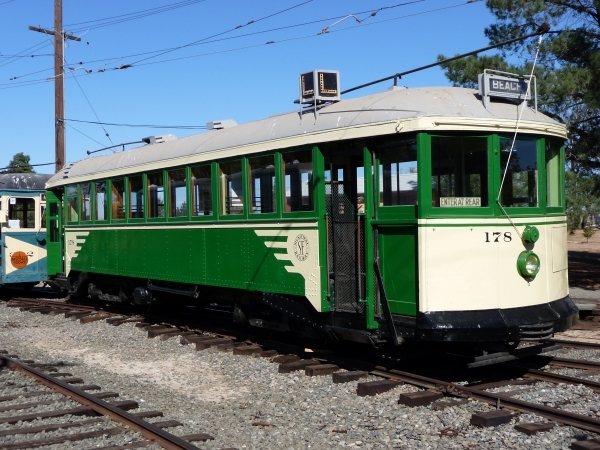 The Bay Area Electric Railway Association purchased the 178 from the Muni in February of 1959, and moved it to Marysville, California, for storage on a Sacramento Northern spur for occasional operation on the electrified trackage in the Marysville-Yuba City area. It was moved to Rio Vista Junction in August, 1964 to join the rest of the BAERA collection. 178 returned to San Francisco in 1982 to be part of the Trolley Festival on Market Street while the City rebuilt it’s cable cars lines. In 1983 the 178 returned to the Western Railway Museum and still operates today. Technical Data: Heavy steel streetcar. Built by Bethlehem Shipbuilding Works in San Francisco in 1923. Seats 44 passengers, one operator. Weight, 51,000 pounds. Trucks: Standard O-50. Wheels, 33” wrought steel. Axle. Journals, 4 1/4 X 8 plain bearing. Traction motors, 4-65 horsepower @ 600 VDC, outside hung. Air Brake Equipment: Westinghouse Traction Brake, SM3. Motorman’s valve, PV-1. Emergency valve, H-2. Brake cylinder, 12 X 12. Governor, S16. Air compressor, Westinghouse Air Brake DH-16. Dimensions: Width, 9’ 2”. Length over buffers, 47’ 4”. Height, 12’ 2”. Truck centers, 20’ 10”. Truck wheelbase, 58”. Propulsion Equipment: Westinghouse Electric and Manufacturing, type HL. Master controller, 15B. Switch group, 480 unit switch. Traction motors, 306CV. Control switch, 494-B. Control resistor, 197-J. Power resistors, 8” 3 point. Misc Data: Trolley shoe, Ohio Brass form J6. Trolley base, US-20. Trolley catcher, Ideal made by The Trolley Supply Company of Canton, Ohio. Bell, single stroke. Current Condition: This car is complete, operational, and in excellent condition. It was acquired out of revenue service by the Association and had been maintained in good condition since then.